Herzog Music is happy to announce that established local improvisational guitarist Pete Fosco is joining our roster of instructors. Educational outreach is at the core of our mission in conjunction with the Cincinnati USA Music Heritage Foundation, and Pete joins a staff with expertise in teaching guitar, drums, violin, piano, lap steel, turntables and a whole lot more - all in the historic setting where Hank Williams, Bull Moose Jackson and early King Records artists cut tracks which changed the world. At Herzog, Pete will be available to provide lessons in experimental and improvised guitar playing, including unique or unusual tunings, extended techniques and improvisation workshops, and exploration of scales and exercises to encourage creative development with any instrument. Pete is available for both group and individual sessions, and has a BFA in electronic media studies from the University of Cincinnati, College-Conservatory of Music. 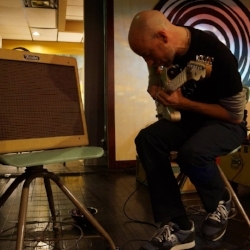 Primarily a solo performer, Pete has also performed in collaboration with Matt Weston (percussion), Chris Adams (guitar), Haley Fohr/Circuit Des Yeux, C Spencer Yeh, Sam Ferris Morris, Aaron Michael Butler,Jennifer Simone, Ofir Klemperer, Billy Gomberg + Anne Guthrie, Jen Powers + Eoin Bell-Games, Kate Wakefield, and as a member of Early Tunnels with Jon Lorenz (saxophone/electronics), and as a member of the Wasteland Jazz Ensemble. He operates the label greenup industries from his home and currently resides in Covington, Kentucky, with his wife, two sons and two dogs. Tune In For Podcast Episode 15!